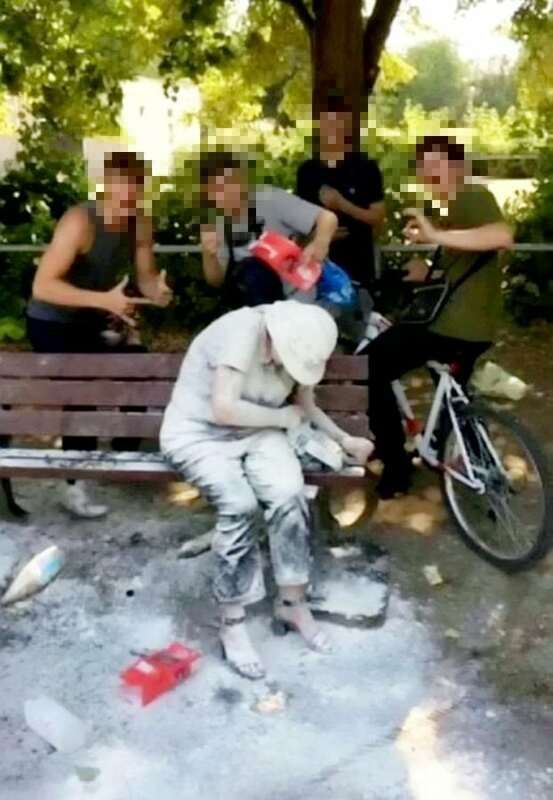 Four teenage yobs have been arrested after they chucked flour and eggs on a disabled woman and then posed for a sickening picture. 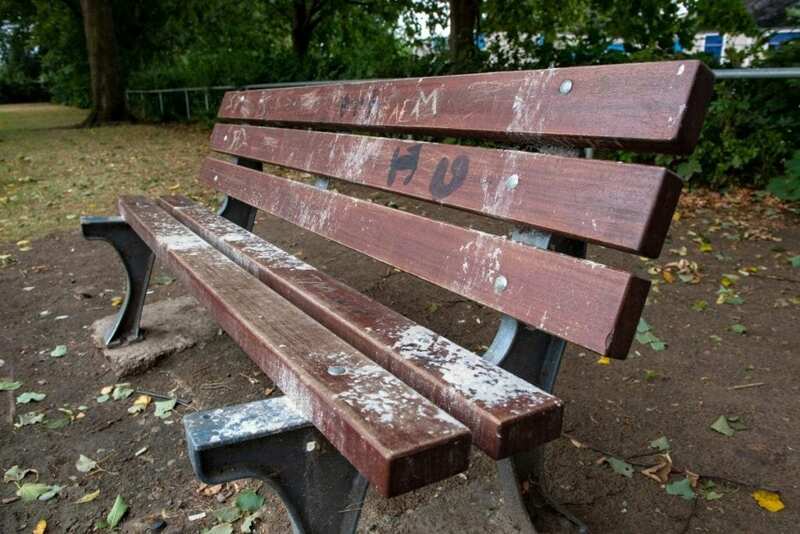 In the disturbing snap, the smirking teens can be seen taunting the woman as she sits cowering on a park bench, covered head-to-toe in the mixture. Inspector Anthony Bridgland said: “This type of behaviour is totally unacceptable and we are treating the matter seriously. Now fears were mounting of a vigilante backlash after four teenagers were arrested for a shocking attack on a disabled woman. The image was posted along with appeals to name and shame the teenagers allegedly involved in the incident in Bury St Edmunds, Suffolk, on Friday evening. However today at least one man said he had been threatened after being mistakenly identified as one of the arrested teenagers. Police have said two 17-year-old boy and two 15-year-old boys have been arrested in connection with the incident but have been released on bail. Social media star Robin Armstrong posted the image to his 750,000 followers with a lengthy video rant in which he says he wants to “lead the way” in finding the youths. He said: “You little f***ing nothings have been over to an old woman with disabilities, poured water all over her head and then poured flour all over and stopped for a photograph. “That photographs says a thousand things – I don’t even have to say any words. “You scummy little w******. You deserve to have your heads ripped off your shoulders. “I’ve got your names now so I’m going to put your names in the comments and your profiles in the comments. “You’re going to be chased out of your city – hunted down. “Your mums and dads lives are f****** wrecked because of you. “Posing for a photograph? The only photograph you are going to be posing for are the ones the police are going to have. “Or the ones on the front of your tombstone because you deserve to be stoved in. “Share this video and we will find these fuckers. On Sunday a man wrongly threatened on Facebook who cannot be named for legal reasons said: “There’s a photo doing the rounds at moment of a group of young boys harassing an elderly woman in Bury. “They’ve been named and shamed and one of them happens to also be called XXXX XXXXX. “I would just like to clarify I’m not that XXXX XXXXX and THAT’S NOT ME IN THE PHOTO. People said the woman is disabled in Facebook posts.